Apparatus wheel with a swivel castor and a thermo rubber tread. 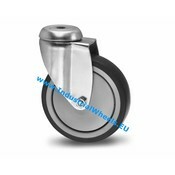 The wheels leave no marks and can handle up to 100 kg each. 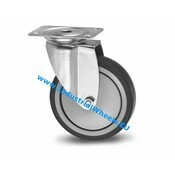 These apparatus swivel castor wheels with thermo rubber tread are perfect for indoor use, such as on carts, furniture and trolleys. 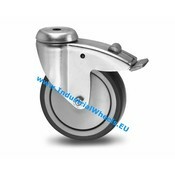 The ball bearing makes the wheels very durable and easy to ride. The rubber tread cancels out a lot of noise. The rubber tread creates a quiet and smooth ride. The downside of the rubber tread is that it's more prone to wearing off. 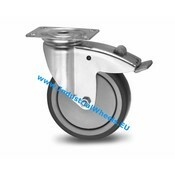 These wheels are often used for care beds, cleaning machines, computer equipment, display stands, dustbins, file carts, food transport equipment, laundry carts, medical-technical equipment and newspaper dispensers. They are popular in industrial kitchens and restaurant areas.